Best Screen Protector for Droid Turbo 2. Why to Buy a Screen Protector for the Droid Turbo 2? Droid Turbo 2 is the first phone from Verizon which comes with a shatterproof display. Those who have already seen the video reviews of the Droid Turbo 2 AKA Moto X Force might have come to know that it has the strongest display a smartphone has ever got. Most of the smartphone users use a screen protectors on their smartphone screen to protect the display from getting damaged. 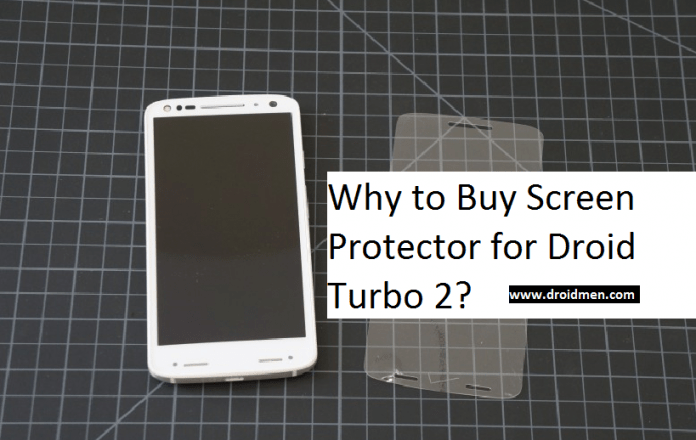 You all might be wondering “Why does the Droid Turbo 2 needs screen protector/screen guard?”. Don’t know why? I’ll be telling you why? Why Does The Shatterproof Display of Droid Turbo 2 Requires a Screen Protector To Look Neat? Though the Droid Turbo 2 has a shatterproof display but the phone is not scratch resistant and so while using the phone in our day to day life there are many chances that you might end up getting your display scratched by the keys, pens, coins etc. Check the Video at the 1.48 sec i.e. Droid Turbo 2 Scratched. The uppermost layer of the Droid Turbo 2’s display is easily replaceable by the end user said Motorola and they’ll soon start selling the uppermost layer of the display. That would cost some amount, but will replace your scratched layer with the new upper layer. Motorola will be selling the ‘upper layer’ of the Droid Turbo 2’s display in the future, but what about now? I’m pretty sure, most of the Droid Turbo 2 users might have seen some scratches on their phone. This is the main reason why I’d suggest one to go with a tempered glass for their Droid Turbo 2. Okay I can buy the uppermost layer of the Droid Turbo 2’s display then why do I need to spend some of my bucks just to buy a SCreen Protector? We know that the uppermost layer of Droid Turbo 2’s display will be available for purchase in coming months. Motorola has said that it can be replaced at home itself, so the user won’t have to go around the service centers for getting it replaced. But this again leaves a question. Scratches aren’t easy to avoid, it can happen while using the phone, it can also happen while the phone is with the keys inside your pocket, or it can also happen when you are holding an instrument which can cause scratches. So how often would you change the display’s uppermost layer? As a smartphone user, I personally don’t like changing the screen guard again and again? I’m also pretty sure that none of them would like to spend their time changing the upper layer of the display? Do you? No right? So, this is one reason why I’m recommending the usage of screen protector/screen guard for your Droid Turbo 2. In case you are not looking for cases with tempered glasses/screen protector then you can try going to the List of Best cases for Droid Turbo 2. Previous articleHow to Remove/Replace Kingroot (KingUser) with SuperSU. Next articleNon Removable Battery in Mobile Phones – Advantages & Disadvantages.